How to cook moose steak! Hi there, I would like to know the best way to fry a moose steak with a frying pan on the stove ...ie at what heat?...how long?...etc.. Thanks for your question Francois. Your question is kind of open ended as you have not specified what type of cut of moose steak you are planning to cook. As a general rule you can cook moose steak the same as beef steak. That being said, I highly recommend not cooking to well done to prevent your steak from getting tough. The other question I might ask is: What type of fry pan do you plan to use? If I were cooking a moose steak (like the one in the picture, a T-Bone) I would likely use my cast-iron fry pan. First I would add some fat, likely bacon fat. I would pre-heat my pan to medium high and add my steak. Four minutes on each side if the steak is cut to 3/4 to 1 inch thick. Now of course there are many variations to this: you could add onions, mushrooms and or garlic just to name a few. Don't have a cast iron pan? I recommend using Lodge Skillets. You can often find these types of pans in good condition at garage sales as many people are afraid to use them. The tried and true way of cooking with cast iron. You just can't go wrong! Comments for How to cook moose steak! 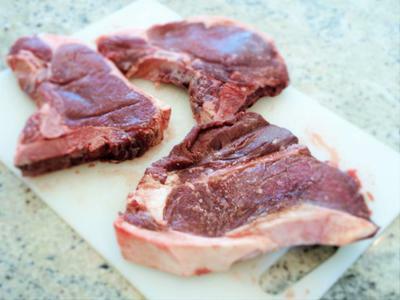 If you marinate the steak, a good idea if it's an older bull, use vegetable oil it will keep the meat from drying out if you cook it a bit to long. Best bet for cooking moose is to ship me some so I can cook the meat and give you the best chance of success.